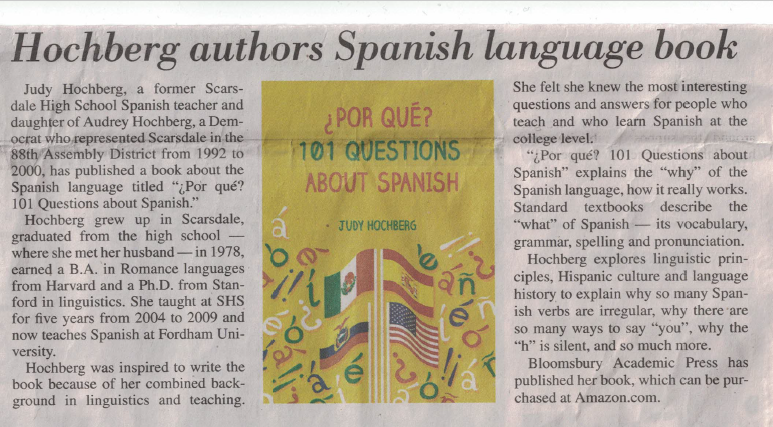 My home-town newspaper, the Scarsdale Inquirer, just published this article about ¿Por qué?. My dad, my biggest fan, was thrilled to see the article, even though it completely sidestepped his role in my ancestry. This is ironic since it was his abiding interest in Spanish that inspired me to take up the language in the first place, whereas my mom had studied French and barely spoke a word of Spanish. That wrinkle aside, it’s a nice article. I’m still planning to get around to that “Cervantes on the beach” series, but first have to fulfill my civic duty this weekend and protest in Washington, DC. Will be back on Sunday if not in jail. This entry was posted in ¿Por qué? 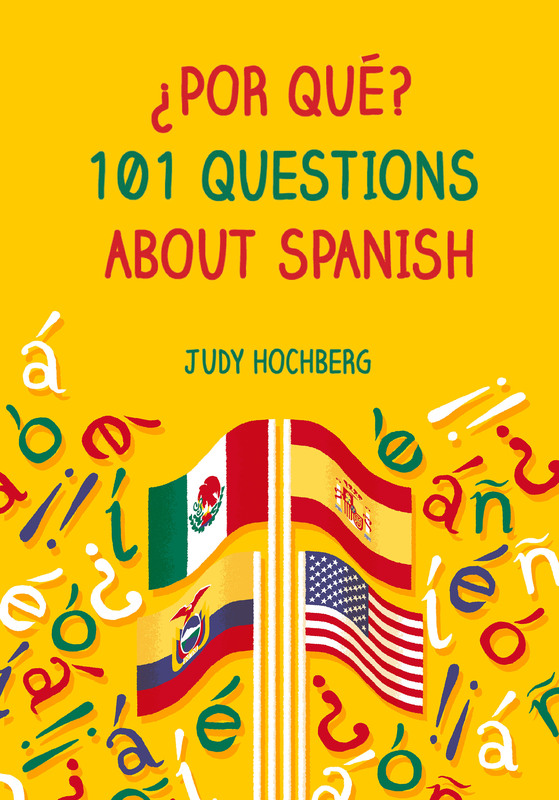 101 Questions about Spanish on 19 January, 2017 by jhochberg. Some nice press from the UK! Times Higher Education, the British equivalent of The Chronicle of Higher Education, has cited ¿Por qué? as one of its “Best new books of the week”. It would be tons more exciting if it were the year instead, but I’ll settle for the week! Screen clip below, link here. It’s funny that both this review and the one in El diario mention the “la la rule”, which is one of the myths I debunk in the book rather than an actual rule of Spanish. Hopefully readers will get the point. This entry was posted in ¿Por qué? 101 Questions about Spanish and tagged history of Spanish, la la rule, rolled r, Spanish r, tilde on 16 December, 2016 by jhochberg. 173,213 sounds pretty good to me! This entry was posted in ¿Por qué? 101 Questions about Spanish on 23 October, 2016 by jhochberg. Today is the official publication day of my book, ¿Por qué? 101 Questions about Spanish. Amazon’s book page is sort of funky — the Kindle price is wrong, and they are pessimistic about delivery times. In any case I would recommend ordering directly from Bloomsbury to take advantage of the 35% discount available with order code PQ101. Please spread the word to your friends and colleagues who care about Spanish, and also consider asking your local and/or university library to order the book. If you patronize an independent bookstore that might be interested in stocking it, do contact me to let me know. Also, I love public speaking, and welcome any opportunities to talk to academic or civic groups within a reasonable radius of New York. and so much more! Hopefully I will soon find the time and energy to pick up this important part of my life. This entry was posted in ¿Por qué? 101 Questions about Spanish on 20 October, 2016 by jhochberg. El Diario reviews my book! With ten days to go till the publication of my book ¿Por qué? 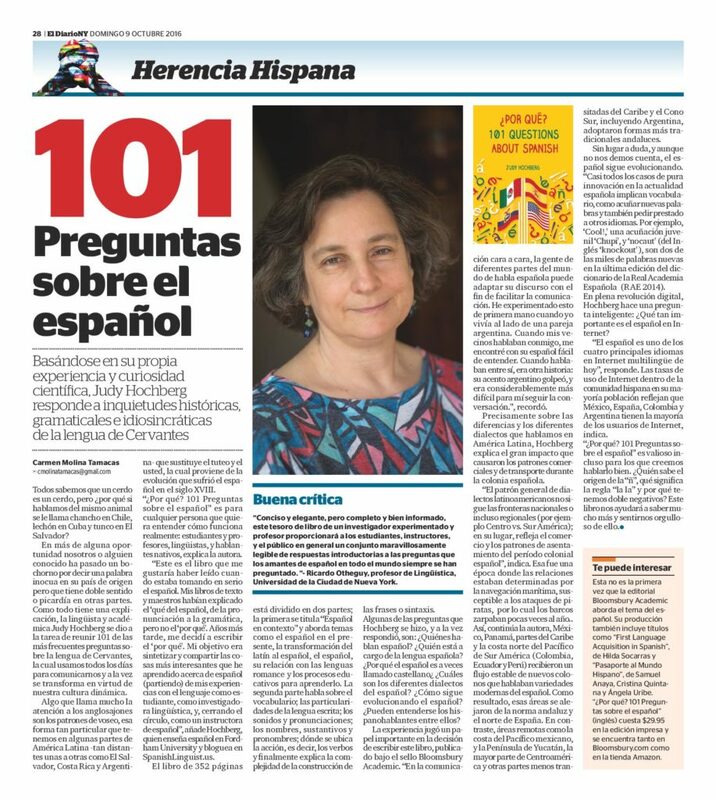 101 Questions about Spanish, the Spanish-language newspaper El Diario has just published a full-page review (below) in its National Hispanic Heritage Month supplement; click here for a slightly more readable image. I hope that this review will help my book find a readership among the Hispanic community as well as academia, a long-held dream of mine. This entry was posted in ¿Por qué? 101 Questions about Spanish and tagged Carmen Molina Tamacas, El Diario on 10 October, 2016 by jhochberg.